You cannot deny the importance of advertisements, they are pretty part of a business. Since getting to know about new people, new clients and new consumers is mandatory while expanding the business; the owner must know how to encounter the target audience through several possible marketing ways that are not repetitive and not boring. An advertisement whether through electronic or print media has a very strong efficacy in making people familiarize with branding and product. It has to be bold and build up in a manner which is easy to be understood and not a vague deception where people get carried away or misunderstand the meaning out of it. Basically the whole gist of the product is put forward through an Ad, Readers/viewers can glare at the picture that what the product is all about, how it functions, what type of purpose it serves, how it works, what the brand stands for and all the pivotal stuff. Advertisements usually cost heavy pennies, therefore they are carefully crafted and made to the point but depicts directly what it holds. Designers usually add up fancy elements, color schemes and fonts that are bigger and better to read, of course it is impression building. 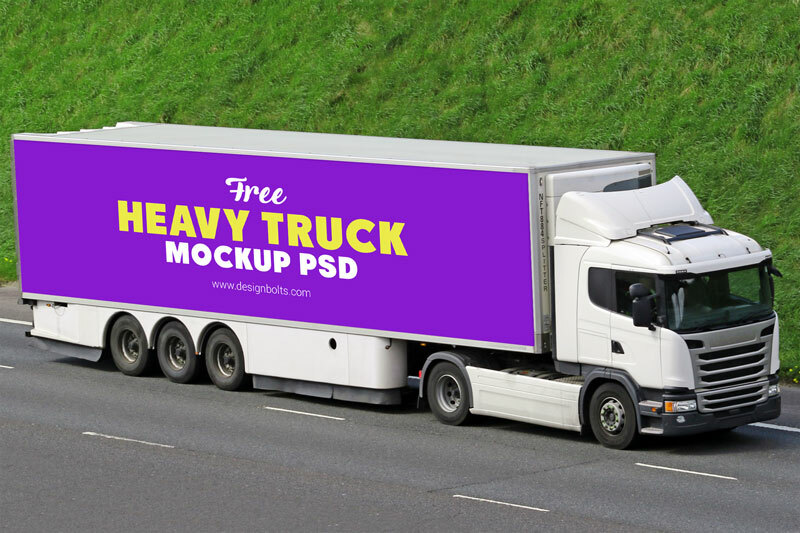 Well down here I am presenting before you free heavy duty truck mockup, you can add up and insert your own design element and it is ready to be presented before the client. Truck advertisements are recommended because when a truck moves about in the town, on the roads and within the city, people can easily reach at the advertisement displayed on the walls of it. Also the giant size truck looks quite captivating so we are always sure that it will hit the audiences with the look and they will stand and stare at the advertisement of it. This way a successful end is achieved by the owners/brand. Check this out right away and for more amazing design feed, subscribe us!